This study revisits sovereign credit ratings, contagion and capital flows to Emerging Markets (EMs), and clarify the relationship between them. Specifically, this study analyzes how the changes in sovereign rating influence different types of capital flows to EMs and whether the changes in the different kinds of capital flows in one country be explained by a sovereign ratings’ change in another country. Using Arellano-Bover/Blundell-Bond Dynamic Panel System GMM for 23 EMs over the period 1990-2012 the results of the study suggest that sovereign ratings is a crucial factor for EMs’ access to international capital markets and that capital flows is a major source of financing for Ems. In addition, the results show that financial contagion may continue to be a threat to capital flowing into EMs and that financial crisis increases the impact of sovereign rating on foreign direct investment but is not the case with portfolio investment. Arellano, M. and Bond, S. (1991). Some Tests of Specification for Panel Data: Monte Carlo Evidence and an Application to Employment Equations. Review of Economic Studies, 58, 277-297. DOI: 10.2307/2297968. Albuquerque, R. (2003). The Composition of International Capital Flows: Risk Sharing through Foreign Direct Investment. 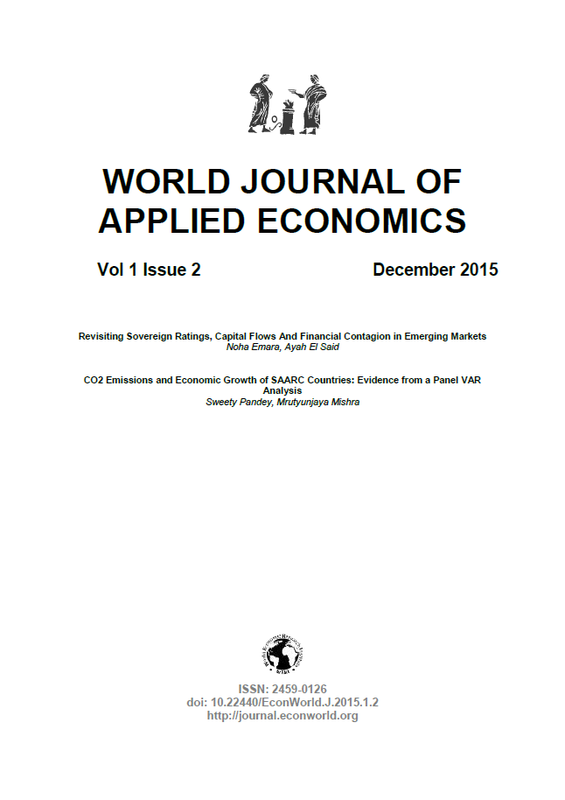 Journal of International Economics, 61(2), 353–83. DOI: 10.1016/S0022-1996(03)00013-8. Caselli, F. & Esquivel, G. & Lefort, F. (1996). Reopening the Convergence Debate: A New Look at Cross-Country Growth Empirics. Journal of Economic Growth, 1(3), 363-89. DOI: 10.1007/BF00141044. Chuhan, P., S. Claessens, and Mamingi, N. (1993). Equity and Bond Flows to Asia and Latin America. The World Bank, Policy Research Working Papers, No.1160. Eichengreen, B., A. K. Rose, and Wyplosz, C. (1995) “Exchange Market Mayhem: The Antecedents and Aftermath of Speculative Attacks. Economic Policy, 21, 249-312. DOI: 10.2307/1344591. Fernandez-Arias, E. and Montiel, P. (1995). The Surge in Capital Inflows to Developing Countries: An Analytical Overview. The World Bank Economic Review, 10, No.1. Holtz-Eakin, D., W. Newey and Rosen, H. (1988). Estimating Vector Autoregressions with Panel Data. Econometrica, 56, 1371-1395. DOI: 10.2307/1913103. Glick, Reuven & Rose, A. K. (1998). Contagion and Trade: Why are Currency Crises Regional. CEPR Discussion Papers, No.1947, C.E.P.R. Discussion Papers. Hernandez, L., P. Mellado, and Valdes, R. (2001). Determinants of Private Capital Flows in the 1970s and 1990s: Is There Evidence of Contagion?. IMF Working Paper, No. 01/64. Kaminsky and Schmukler. (2002). Short-run pain, long-run gain: The effects of financial liberalization. World Bank Policy Research Working Paper 2912. DOI: 10.1596/1813-9450-2912. Juttner, J. D., and McCarthy, J. (1998). Modeling a Ratings Crisis (unpublished, Sydney, Australia: Macquarie University). www.econ.mq.edu.au/courses/econ360/Soveig1.pdf. Taylor, M.P., Sarno, L. (1997). Capital flows to developing countries: long- and short-term determinants. The World Bank Economic Review, 11(3), 451-470.